"Splendid . . . not only the most readable yet definitive study of Holliday yet published, it is one of the best biographies of nineteenth-century Western 'good-bad men' to appear in the last twenty years. It was so vivid and gripping that I read it twice." "The history of the American West is full of figures who have lived on as romanticized legends. They deserve serious study simply because they have continued to grip the public imagination. Such was Doc Holliday, and Gary Roberts has produced a model for looking at both the life and the legend of these frontier immortals." "Doc Holliday emerges from the shadows for the first time in this important work of Western biography. Gary L. Roberts has put flesh and soul to the man who has long been one of the most mysterious figures of frontier history. This is both an important work and a wonderful read." "Gary Roberts is one of a foremost class of writers who has created a real literature and authentic history of the so-called Western. His exhaustively researched and beautifully written Doc Holliday: The Life and Legend reveals a pathetically ill and tortured figure, but one of such intense loyalty to Wyatt Earp that it brought him limping to the O.K. Corral and into the glare of history." 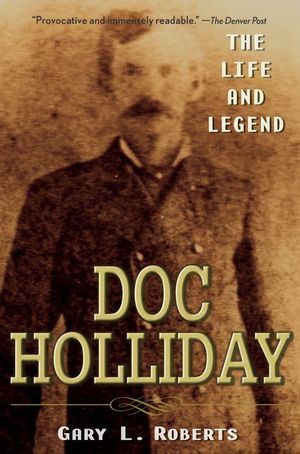 "Gary L. Roberts manifested an interest in Doc Holliday at a very early age, and he has devoted these past thirty-odd years to serious and detailed research in the development and writing of Doc Holliday: The Life and Legend. The world knows Holliday as Doc Holliday. Family members knew him as John. Somewhere in between the two lies the real John Henry Holliday. Roberts reflects this concept in his writing. This book should be of interest to Holliday devotees as well as newly found readers." Gary L. Roberts, Emeritus Professor of History, Abraham Baldwin College, is widely recognized as a historian of the American West and frontier violence. He has published more than seventy-five articles on Western history and coedited a book on Georgia politics. He is the author of Death Comes for the Chief Justice: The Slough-Rynerson Quarrel and Political Violence in New Mexico. Prologue: The Measure of a Man. 1 Child of the Southern Frontier. 2 The World Turned Upside Down. 4 Cow Towns and Pueblos. 5 The Price of a Reputation. 7 The Fremont Street Fiasco. 10 A Holliday in Denver. 12 The Anatomy of a Western Legend. Epilogue: The Measure of a Legend.